Pundi X (CURRENCY: NPXS), a blockchain-based point-of-sale (“POS”) solution provider is now listed by Coinbene, one of the largest and fastest growing cryptocurrency exchange platforms based in Hong Kong and Singapore. Pundi X recently successfully completed its public token sale on January 21, 2018. The company quickly reached its hard cap of 35 million US dollars in less than 90 minutes. It plans to use the funding to install at least 100,000 Pundi X POS devices over the next three years across all target markets. Also, the first batch of these 4,000 blockchain-based POS devices will be delivered to Japan, Korea, Singapore, and Switzerland, enabling both the retailers and the consumers to do cryptocurrency to fiat or fiat to cryptocurrency transactions easily. Launched in October 2017, Coinbene has already become one of the largest exchange platforms in South East Asia. The daily trade volume is over 35 million US dollars. Coinbene features a secure and user-friendly interface that provides multiple cryptocurrencies trading pairs. The platform can process more than one million orders per second. 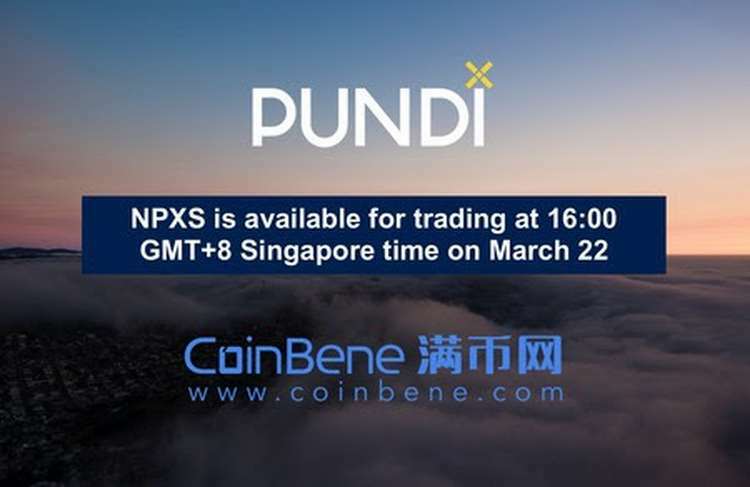 Starting from 16:00 GMT+8 (Singapore time) on March 22, NPXS is available to trade on Coinbene.